The Pan American Union Building was built between 1908 and 1910. The cornerstone was laid on May 11, 1908 by Theodore Roosevelt, Elihu Root, and Andrew Carnegie. The headquarters of the Organization of American States, it hosted the initial meeting of the International Labour Organization in 1919 and the Washington Naval Conference of 1921. 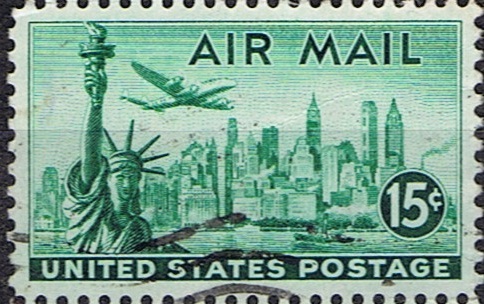 A Lockheed Constellation and the New York skyline are shown on the 15¢ value. The Lockheed Constellation was first flown in 1943. The “Connie” first served as a military transport before becoming a civilian airliner. 856 Constellations were built and the aircraft were used from their introduction until the 1990s. 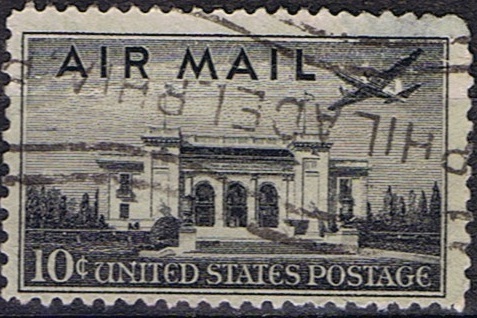 A “Connie” was Dwight D. Eisenhower’s presidential aircraft. Major operators were Trans World Airlines, Eastern Airlines, Pan Am and Air France. There are few views that are as iconic as the New York skyline. We can see the Statue of Liberty, Empire State Building and many more buildings. 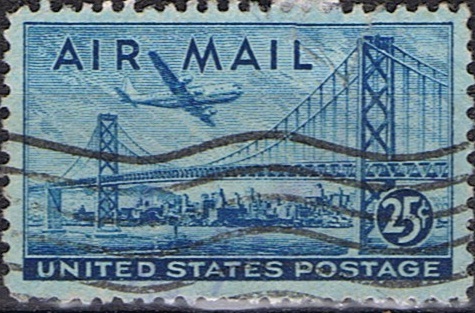 Finally the 25¢ value shows us a Boeing Stratocruiser flying over the Golden Gate Bridge in San Francisco. The Stratocruiser was first flown on July 8th 1947 and was based on the Stratofreighter which was derived from the Superfortress. With only 59 aircraft built the Stratocruiser was one of, if not the most luxurious airliner of this period. Major operators were Pan Am, BOAC and Northwest Orient Airlines. Built between January 1933 and Aril 1937, the Golden Gate Bridge is most likely the worlds most photographed bridge. Linking San Francisco and Marin County the Golden Gate Bridge spans 8,981 feet. It stands 746 feet high and at high tide provides 220 feet of clearance below the bridge deck.